Candlelight Processional | It's "All in WDW"
Happy New Year, WDW Fans! Let The Fireworks Begin! Welcome to New Year’s Eve, my friends! 2017 is mere hours away. A brand new year of big Walt Disney World events is just around the corner! All great choices. We enjoy them too! Next, we engaged in a slight bit of “re-imagineering”. Our task? 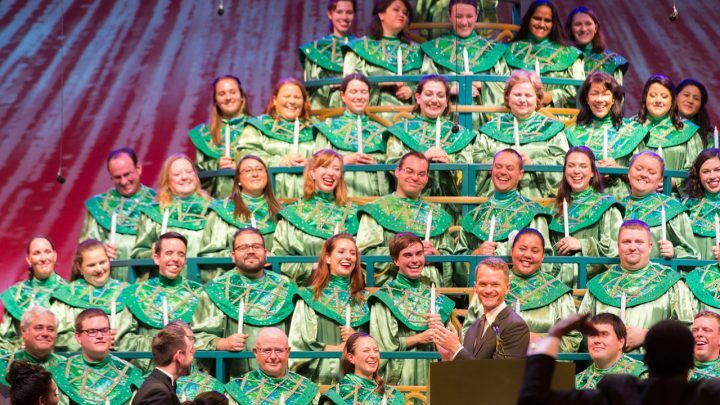 We were asked to “hire” three new narrators to perform Epcot’s famed Candlelight Processional! I don’t know about you, but I can’t wait to hear The Rock and Sheldon share the story of Christmas with us all! For me, there’s nothing that’s upcoming that is bigger than this … Pandora – The World of Avatar – is set to open this coming Summer! Soon, we’ll all be able to enter into ” … the base camp of Alpha Centauri Expeditions, the eco-tour group that is preparing Pandora for future explorers and adventure seekers.” I can’t wait! Folks, on behalf of All in WDW and the WDW Main Street Podcast – from Doug, Dennis, John, and myself – have a Happy (and safe!!) New Year! Now! Can we light up the sky in celebration? Of course! Send up the fireworks! OK! Enough “candlelight” already! Actually, it’s time to present the “winners”! So, here we go! The first poll up was presented a week ago … our quest to choose the All in WDW Readers’ Favorite Epcot Holiday Storyteller! Twelve days of Christmas and twelve choices. I know. It was tough. And, probably, a bit overwhelming. In the end, however, hailing from the fine country of Norway, Sigrid and Julenissen took the crown! It was, by NO means, a unanimous decision. In fact, for the most part, your votes were spread, pretty evenly, across the board. For the final tally, stop back and look. The “feature” poll came along a few days later when we tackled Epcot’s “centerpiece” holiday attraction – The Famous Candlelight Processional! Again, it wasn’t a “runaway”, but it also wasn’t a surprise. After gaining the most of our support, NPH – er, Neil Patrick Harris – lays claim to the title. He IS the All in WDW Readers’ Favorite Candlelight Processional Narrator! Finally, I tossed you, what turned out to be, a VERY difficult trivia question a few days ago. I asked, “… who was Epcot’s very first Candlelight Processional storyteller?” The vast majority of you picked Charlton Heston for that honor. Now, there! We ALL learned something about one of Walt Disney World’s renowned holiday traditions with that trivia challenge.